As many of you already know, I visited Northern Thailand this past May to be a part of the 10th anniversary mission of Pencils for Kids, Inc. It’s an amazing nonprofit that raises funds to deliver backpacks filled with school supplies and uniforms to children in Myanmar, Indonesia, and Thailand every year. In 2017, PFK delivered more than 2,200 backpacks to children in need! My visit to the villages in Chiang Rai to help deliver backpacks this year was incredibly moving, and as someone who cherishes my education and independence, it felt good to help encourage access to education for others less fortunate. And it’s why I’m helping Pencils for Kids with their annual fundraiser in San Francisco this year, with 100 percent of the event proceeds going directly to supply children with backpacks. 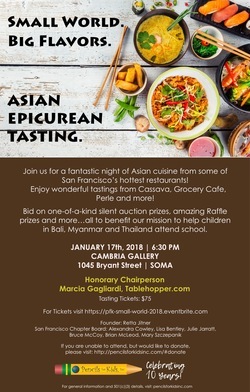 As an Honorary Chairperson and Ambassador for Pencils for Kids, I’m curating the restaurants and wine and spirits for their fundraiser event in San Francisco on Wednesday January 17th, 2018: Small World. Big Flavors. We are hosting the event at the stylish Cambria Gallery in SoMa (the same fab place where I hosted the fundraiser for Mexico in October!). I’m so excited for us to be back there; it was the perfect party pad, with wonderful hosts! We’re going to be hosting a walk-around tasting with restaurant partners making Asian street food for the event. So far we have the new Perle Wine Bar in Montclair joining us (chef Rob Lam is going to be making an assuredly tasty Vietnamese dish for us! ), the Burmese Grocery Cafe (which has a new location in Jack London Square in Oakland), Cassava (I hear a rumor they’ll be making some Japanese-inspired ribs! ), and Indian Paradox (one of my favorite hidden gems on Divisadero for Indian street food—and they just launched brunch!). We also have Cambodian Nyum Bai joining us—Nite Yun will be serving a salad (she is opening her brick-and-mortar location in 2018!). And you can check out the flavorful Thai-Laotian dishes from the new Esan Classic (from the Lers Ros team)! You’re definitely going to want to save room for dessert, because Belinda Leong of B. Patisserie is going to be making something sweet! There will also be cocktails (courtesy of our generous sponsor Rémy Cointreau) and beautiful wines kindly provided by Chambers & Chambers (those of you who came to the SF Loves MX fundraiser remember those two gorgeous French rosés!). The fine folks at HelioRoast are also going to be offering coffee service—you’ll get to taste their local, microroasted coffee! If there is someone who would like to donate beer for the event, please get in touch! We will also have a silent auction and raffle with some fantastic items (we’re happy to have any contributions!) and a goodie bag! Tickets are only $75 (the event is 6:30pm-9:30pm), and since it’s a tablehopper event, you know you’ll be well fed (and beveraged, heh) while doing a whole lot of good. Maybe buy a friend a ticket for a holiday gift? I really hope to see you on Wednesday January 17th, 2018! If you are unable to attend, but would like to make a donation, please visit PFK’s donation page, thank you!